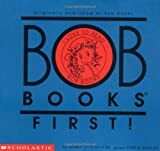 If you have young children just learning to read, you can’t do better than to get them some Bob Books. They are short and extremely simple. The first page of the first book says just “Mat.” Even the drawings are simple: they are minimalist line drawings, almost doodles, that help the child to feel that this book is somehow something they can manage. Bob Books also gave my boys the sense that they could create books. Since the drawings, words, and even physical production are so simple, they saw that they could create similar books themselves. It’s easy to let them draw a simple story, narrate the words that you write on the pages, then staple the whole thing together.